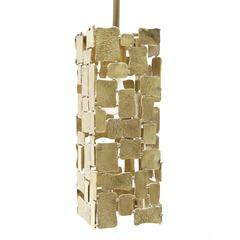 We have never come across a star lamp of this quality. Each star section is cast prismatic glass. The glass also has a lavender cast to it. The tint happens over years of use and is part of the patina and aging process for some types of glass. The Moravian Star tradition goes back to German schools almost 200 years ago. These were originally used as a teaching aid in Geometry. We may never see another example like this. This is an interesting double fixture with two bullet shaped prismatic glass shades. The bottom bar can tilt to a 45 degree angle or kept parallel to the table. The Moravian star chandelier by C-J Weinstein. 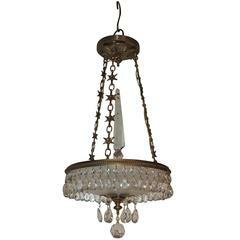 A very beautiful, handmade and electrified, leaded clear glass Moravian star lighting fixture. 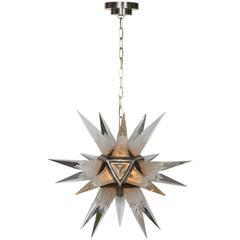 A very large and beautiful, handmade and electrified, frosted glass Moravian star lighting fixture. For your consideration a rare Mid-Century Modern Pop Art aluminium and plexiglass Moravian Star pendant lamp. Italy, circa 1960s.